I have to confess that I put off writing this review for several months for one main reason. Some Writer! is a work of perfection, and I didn't think I could find the words to write a review worthy of the book. However, as 2016 has come to a close I wanted to be sure to give some love to Some Writer! before I take a leave of absence from the blog. 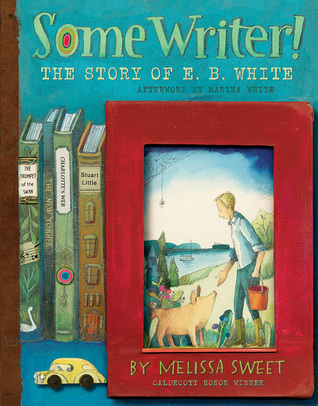 Melissa Sweet masterfully blends photos, mixed media collage and narrative to capture the life and essence of beloved children's writer, E.B. White. Words were very important to White, and Sweet places the words of the writer throughout the book in the form of poems, quotes, and letters. The book traces White's early life and summers in Maine and follows his path from a magazine "short writer" to a successful author of children's books. Readers will be surprised to learn about the controversy surrounding Stuart Little and the criticism from well-known librarians. Who knew a mouse born to human parents could be so controversial? Throughout the book, Sweet shares primary documents including pages of from the original manuscript of Charlotte's Web. I've read Some Writer! from cover to cover twice and plan to read it again. There are so many things to notice on each page: a delicate watercolor illustration of a flower, a vice framing a diagram on boatbuilding, a map painted on a piece of wood with various 3D objects, a tiny handmade canoe, a silhouette of White on a page from The Elements of Style. Each page is a masterpiece. Don't miss the touching Afterword written by White's granddaughter, Martha White. Some Writer! deserves a spot in the biography section of school and public libraries, and it would make a fitting gift for an aspiring writer or lover of books.